In honor of National Pretzel Day (April 26th), indulge in this classic Bavarian treat at home. It's easier than you think! 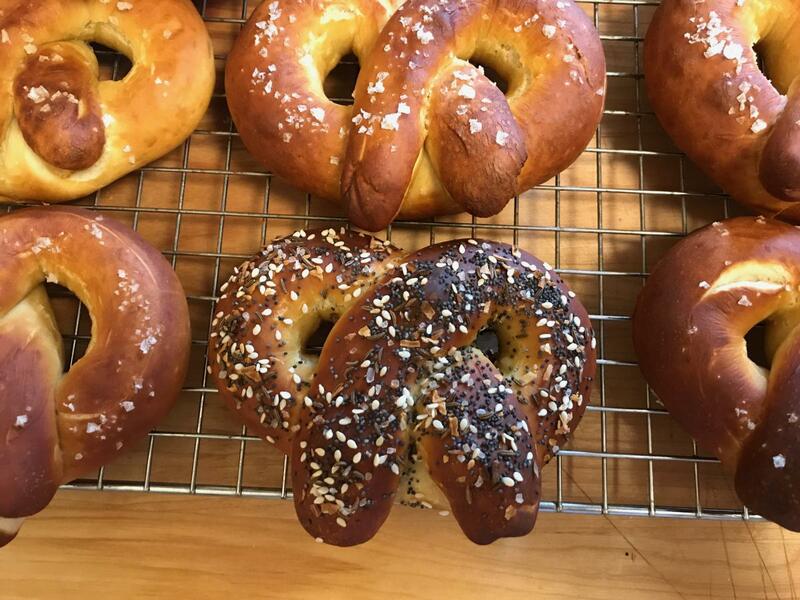 We all love the smell of those soft pretzels at the mall, but why go buy just one when you can make a dozen yourself? Soft pretzels are actually not as difficult to make, or shape, as they may seem. The 6-ingredient dough comes together in a matter of minutes, and in under 2 hours you can have delicious homemade pretzels that that will satisfy any soft pretzel craving, and save you a trip to the mall. Personally, I’d rather make my kitchen smell that yummy anyway! I know this sounds strange, and seems like A LOT of baking soda, but that’s what is needed to approximate the effect of lye on the dough. Lye is the key ingredient in the browning and flavor of traditional pretzels, but it is generally considered too dangerous for household use. Aren’t you glad there’s a safer substitute? 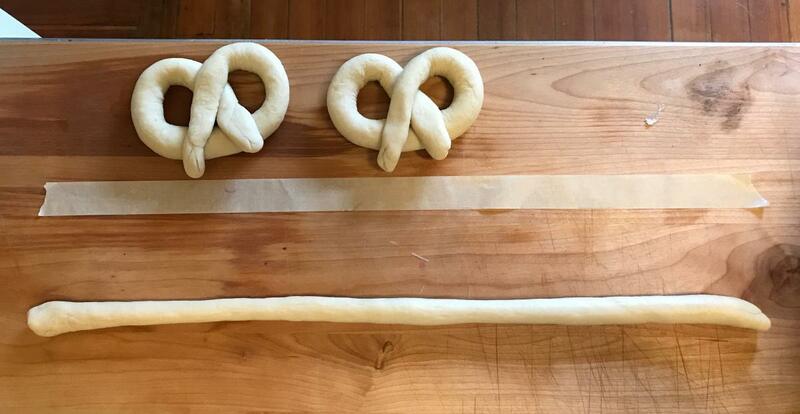 While baking soda won’t completely mimic the best Bavarian pretzel you’ve ever tasted, you’ll still be able to accomplish a pretty impressive feat in your home kitchen without endangering yourself or your family. Alton Brown boils his pretzels with 2/3 cup of baking soda before baking, which is certainly a reasonable alternative. But if I could avoid bringing a giant pot of water to boil AND have browner pretzels, I wanted to give it a try. The answer came from the father of modern food science, Herold McGee, in this NYT article. Baking the baking soda in a low oven increases its alkalinity, making it work more like lye. Briefly soaking the pretzels in a high-octane baking soda solution causes them to brown better in the oven. It’s worth the time and minimal prep work required to yield truly golden brown and properly flavored pretzels. If you have a kitchen scale, use it to weigh the dough pieces as you’re portioning. This takes the guesswork out of creating evenly sized pretzels, which will also bake more evenly. Measure a 20-inch piece of masking tape and adhere to your counter before rolling the pretzels. This will make it easier and faster to roll the ropes to a consistent length. Get creative and coat your pretzels with Everything Bagel seasoning, cinnamon sugar, grated Parmesan, or your favorite topping. Just be sure to do it while the dough is still wet so the toppings adhere. Use this handy trick for stuck pretzels. The wet pretzels tend to stick to parchment paper when baked, so make sure your sheets are well greased. Remove your pretzels from the parchment paper shortly after they come out of the oven. If your pretzels stick anyway, carefully pour a small amount of water under the parchment paper while the baking sheet is still hot. Wait 30 seconds to a minute, and then the pretzels should release easily. If your skin is sensitive, use gloves or slip your hand inside of a plastic sandwich bag when handling the pretzels in the baking soda solution. If you want to get fancy, you can top your pretzels with a combination of cinnamon sugar or everything bagel seasoning instead of just salt. Preheat oven to 250 degrees F. Spread baking soda evenly on a baking sheet and bake for 2 hours. Set aside and let cool. Transfer dough to a clean bowl coated with vegetable oil spray. Cover with plastic wrap and let sit in a warm place for approximately 1 hour or until the dough has doubled in size. Turn the dough out onto a lightly oiled work surface and divide into 12 equal pieces (4 ounces each). Keeping the remaining dough covered, roll out each piece of dough into a 20-inch rope. Holding the ends of the rope, cross one at a time over the center line to make the classic pretzel shape. Gently press the dough so that it sticks together. Soak 3 to 4 pretzels at a time in the baking soda solution for 4 minutes. 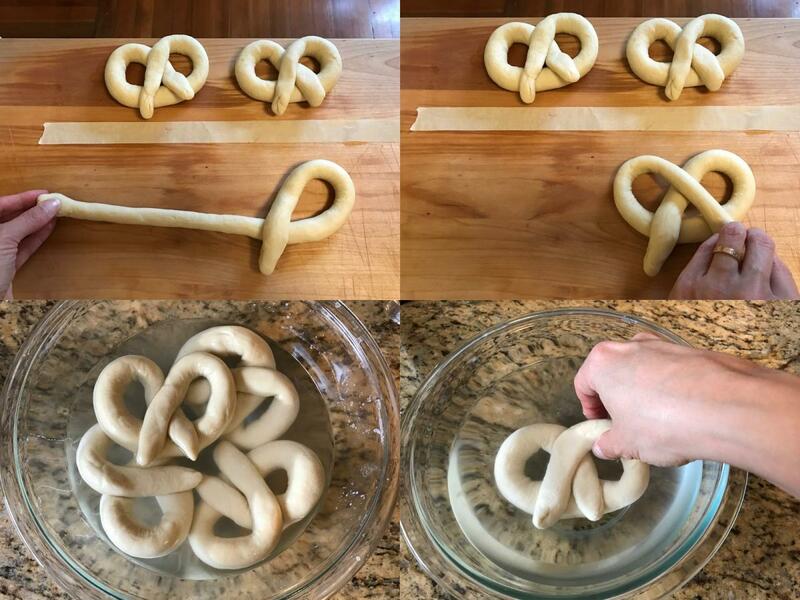 Remove each pretzel from the solution and dip in the fresh water to rinse. Let water drip off and transfer pretzel to parchment-lined baking sheet. While pretzels are still wet, sprinkle with salt or desired toppings. Bake until dark golden brown, about 14 minutes, rotating baking sheets halfway through. Immediately transfer to a cooling rack and cool for at least 5 minutes before serving. Serve warm with your favorite whole grain mustard or honey-mustard for dipping.